I love it when bloggers pull together group posts, just for the fun of it. So when Jenni from Pastry Chef Online mentioned marshmallow ice cream as a theme, I was interested. But perplexed. I make a lot of ice cream. I've made marshmallows. But for some reason I couldn't think of a killer idea that was worth posting. So I procrastinated until time was almost up. Then I looked in the refrigerator, saw the leftover strawberries, and got to work. Marshmallows have gelatin in them, so the resulting ice cream base is thick without the need for eggs. And the finished ice cream has an almost fluffy texture. Normally, this quantity of ingredients would fit easily in my ice cream maker. This time, I had to divide it into two batches. So keep that in mind. I weighed the marshmallows, but you can probably eyeball it. I started with a 10-ounce bag of mini marshmallows and I had a slightly-rounded cup of marshmallows left over. Combine the marshmallows, sugar, heavy cream, salt, and about 1 cup of the milk in a heavy-bottomed saucepan. Cook on medium, stirring as needed, until all of the marshmallows are melted. The mixture will be pretty thick. Meanwhile, blitz the strawberries in a blender. Strain the berries through a fine-mesh strainer into the waiting ice cream base. In theory, you could toss it in as-is, but I like to remove the seeds. Let the mixture cool to room temperature. If you have an ice cream maker with its own compressor unit, you can start churning when the mixture is room temperature, if you're really anxious. Otherwise, chill the mixture in the refrigerator until it's cold, then churn according to the manufacturer's instructions. Remember those left over marshmallows? They'd make a fine garnish, wouldn't they? If you're being particularly cheffy, use a torch to toast them. *I didn't want to use vanilla extract for this, but I did want another flavor in the background, so I went to vodka to add some subtle flavor. I used a whipped-cream flavored vodka, but berry or citrus or cake-flavored would also be lovely. Use what you like, it's your ice cream. If you want to use vanilla (which would be fine), I suggest about a tablespoon. 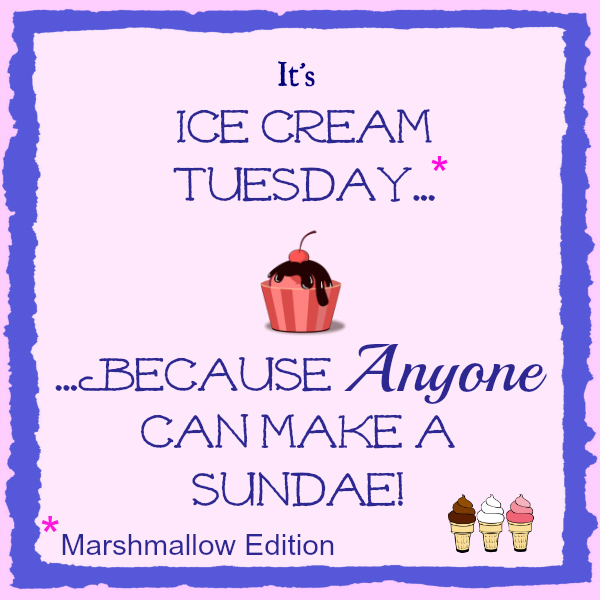 Check the rest of the amazing participating blogs for more recipes and look for us using the hashtags #icecreamtuesday a #marshmallowicecream and #mallowmadness.